These days, just about everything is made out of stainless steel: kitchen appliances, bathroom appliances, jewelry, countertops, and much, much more. Because we all buy a great deal of stainless steel, we also all dispose of a great deal of stainless steel. However, the way in which we dispose of this stainless steel differs. Whereas some of us throw our stainless-steel waste into the trash, others of us choose to recycle it. Are you interested in recycling stainless steel in Chicago? If so, read on! While there are many different types of stainless steel out there, all stainless steels share the same general characteristics. An alloy, stainless steel contains high amounts of iron, nickel, and chromium. However, this isn’t all that stainless steel contains. Within the alloy, you can also find tungsten, vanadium, titanium, and a number of other metals. Most stainless-steel products you see on the market today contain recycled substances. Most of these substances lose only trace amounts of quality each time they are recycled. If you want to keep the price of stainless steel products cheap, it’s wise that you recycle your metals. When stainless steel is recycled, it goes through a number of different stages. Each stage is vital in ensuring that the recycled stainless steel offers top-notch functionality. Interested in learning about the process of recycling stainless steel? If so, read below. 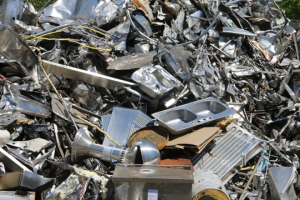 The first stage in recycling stainless steel is separating stainless steel products from other types of metal products. You must separate the stainless steels from the irons, aluminums, and all of the other types of metals which you collect. Whereas many metals are separated with the use of a magnet, stainless steel often isn’t. The reason for this? Some stainless steels are not magnetic. After all of the stainless steels have been separated from the other types of metals, the stainless steels will be shredded down into smaller pieces. These smaller pieces will then be bailed together so that they can be transported more easily. The reason that the steels are shredded is that they are much easier to melt when broken down into small pieces. Now that the stainless steel has been shredded and broken down, it will need to be melted. The stacks of shredded stainless steel will be thrown into an extremely hot furnace where they will be melted down into a uniform liquid. Melting temperatures will often be regulated to ensure that the structural components of the stainless steel are not compromised in the process. After the stainless steel has been melted down, it will have to be checked for any abnormalities. It is possible that some external stimuli still exist within the melted steel mixture. This external stimuli will have to be removed. If it’s not removed, the stainless steel will not reform in the way that it’s designed to reform. The last stage of stainless steel recycling is reforming. The melted stainless steel will be poured into molds in order to create new products. Some of these products might be car components, pipes, watches, etc. Hoping to Recycle Stainless Steel in Chicago? Do you have old stainless-steel products which you are trying to get off your hands? Hoping to recycle stainless steel in Chicago? If so, we here at Central Metal Recycling are the people to see. We recycle metals of all kinds, including stainless steel, brass, aluminum, copper, and much, much more. We look forward to serving you. Contact us today to get started by speaking to one of our experts!